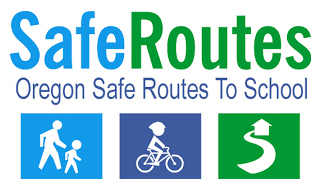 Commute Options launched Safe Routes to School (SRTS) in 2005 as a way to encourage and educate Central Oregon children and parents on the benefits and safety knowledge of biking and walking to school. SRTS creates fun, convenient, and safe opportunities for children to walk and bike to and from school. 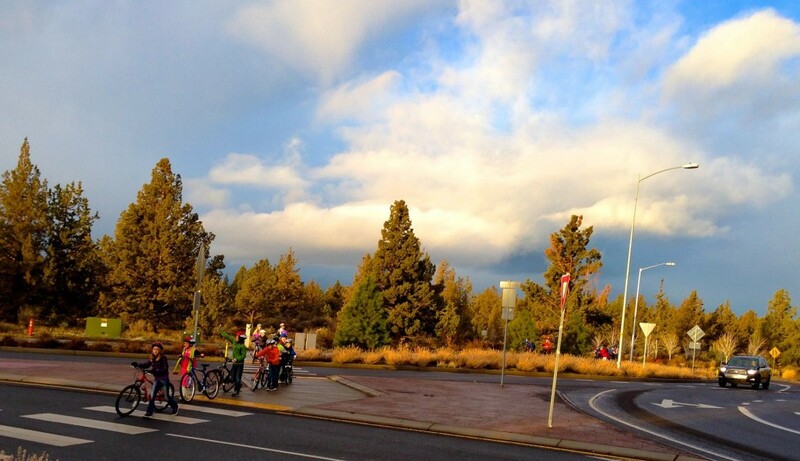 Commute Options is currently working with Elementary and Middle schools in the Bend La Pine School School District. Check out what we’re doing at your school! Click on any of the schools below to find our suggested walking and rolling route maps. Bear Creek Elementary loves to Walk and Bike to School. Last year Commute Options taught more than 700 students at Bear Creek how to walk and bike safely. Click here for information on the Bear Creek Walking School Bus. The Cascade Middle School Mountaineers are champions of Walking and Rolling to School. Click here for information on the Cascade Walking School Bus. Elk Meadow Elementary School is enthusiastic about walking and rolling. Use this map to walk and roll to school! This year we are excited to spend September teaching the 4th/5th graders how to walk and ride safely. Click here for information on the Elk Meadow Walking School Bus. High Lakes loves to walk and roll! Last year we had the privilege of teaching over 275 4th+5th graders how to walk and ride safely. In addition we spent 1 hour with each 3rd class practicing safe walking skills. Click here for information on the High Lakes Walking School Bus. Juniper Elementary is jazzed on walking and rolling to school. Last year, we spent PE with 4th and 5th graders learning hand signals, rules of right of way and safe road crossing skills. Looking forward to another great year at Juniper! Click here for information on the Juniper Walking School Bus. At Pine Ridge there is a lot of enthusiasm for walking and rolling! All of the 4th + 5th graders got the opportunity to learn to walk and ride safely. We also got to work with the kindergartners through 3rd graders practicing how to be safe when walking, using crosswalks and sidewalks. Click here for information on the Pine Ridge Walking School Bus. Ponderosa Elementary loves walking and rolling to school! Click here for information on the Ponderosa Walking School Bus. Jewell is all about walking and rolling to school! Be sure to tune in for International Walk and Roll to school day. Click here for information on the Jewell Walking School Bus. REALMs is excited about walking and rolling to school. Click here for information on the REALMs Walking School Bus. With a principal who rides most days, Sky View is full of walk and roll enthusiasm. Last year we with the 6th graders we practiced how to ride on the road as vehicles, using stop signs and roundabouts and learning neighborhood routes. Click here for information on the Sky View Walking School Bus. Miller Elementary loves walking and rolling to school, especially with all those recreation trails so nearby! With almost 250 4th + 5th graders, last year we got to practice safe walking and riding throughout the northwest crossing community. Click here for information on the Miller Walking School Bus. Volunteer with Commute Options and join the fun! We are teaching in Bend LaPine Schools year round. Including fun summer activities. Click here to find out more information and sign up! For educators and coordinators within a school, district or community who want to create fun, convenient and safe opportunities for children to walk and bike to and from school. Learn more information about trainings offered.